Event Espresso is a very robust event registration system for WordPress that is available as both a free and premium plugin. 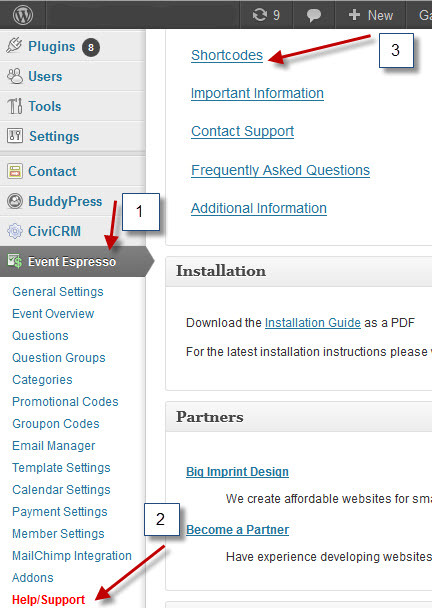 There are also a number of add-on companion plugins available to enhance Event Espresso’s functionality. Displays an “Add Event to Cart” link that can be added to the event details, page, or post. Requires the Multiple Event Registration addon. The [EVENT_LIST] shortcode should not be used as a replacement for the [ESPRESSO_EVENTS] shortcode. Replacing the [ESPRESSO_EVENTS] shortcode will break your registration pages. For more information about the attendee listing shortcodes and customizations. Please view the Attendee Listing Shortcodes page. If you want to display venue details within an event, the venue id is not needed. Just add [ESPRESSO_VENUE] to your event description. You can display the details of any venue to a page, post or event by adding the id of the venue to the shortcode. If you want to display a list of staff members within an event, the staff id is not needed. Just add [ESPRESSO_STAFF] to your event description. If you want to display a list of staff members assigned to an event, to a page, post or event add the event id to the [ESPRESSO_STAFF] shortcode.